LILY SKY-TONE, Art. 123, in Black: 4 balls. Use 1 strand DOUBLE QUICK throughout, or 2 strands FROST-TONE or SKY-TONE. LARGE MAT (Size-9 ½ inches): Starting in center, ch 6, join with sl st to form ring. RND 1: Ch 3, 17 dc in ring, join to ch-3. Work next 3 rnds in back lps. RND 2: Ch 3, dc in same st with sl st, 2 dc in each dc around; join. RND 3: Ch 3, dc in same st, (dc in next dc, 2 dc in next dc) repeated around; join. RND 4: Ch 3, dc in same st, (dc in next 2 dc, 2 dc in next dc) repeated around; join. RND 5: Ch 9, sk 1 dc, dtr in both lps of next dc, (ch 2, sk 1 dc, dtr in next dc) repeated around; join to 7th st of ch-9. RND 6: Ch 1, sc in same st, (3 sc in next 2 sps, sc in next st) repeated around; join to back lp of 1st sc. RND 7: Ch 1, sc in same st, sc in back lp of each sc around; join. RND 2: Attach to center of one lp, * make a 2 inch Rope (as for last rnd), sc in next lp; repeat from * around; join and fasten off. Repeat Rnds 1 & 2. RND 3: Ch 1, sc in same st, (sc in next 2 dc, 2 sc in next dc) repeated around (48 sc); join. RND 4: Ch 7, sk 1 sc, tr in both lps of next sc, (ch 2, sk 1 sc, tr in next sc) repeated around; join to 5th st of ch-7. Repeat Border with Ropes 1 ½ inches long in 1st rnd, 1 ¾ inches in 2d rnd. 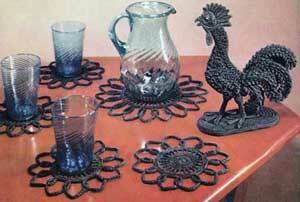 Starch Mats, stretch and pin right-side-up in true circles, press flat thru a cloth and leave until dry. LILY DOUBLE QUICK, Art. 50: 4 skeins Black and 1 skein each Flamingo and Chartreuse. 3 ⅓ yds. black covered millinery wire or other stiff wire. 4 brass rings ¾ inch size. Starting at top, ch 14, sk 1 ch, a small shell of sc, ch 2, sc, in next ch, (sk 2 ch, shell in next ch) 4 times. ROW 2: Ch 3, turn, (dc, ch 2, 2 dc) in 1st shell, small shell in next 3 shells, a large shell of 2 dc, ch 2, 2 dc, in end shell. Repeat Row 2 five times. ROW 8: Ch 1, turn, sm. shell in 1st shell, lg. shell in next 3 shells, sm. shell in end shell. ROW 9: Ch 1, turn, sm. shell in 1st shell, * (lg. shell in next shell, dc between shells) twice, lg. shell in next shell, * sm. shell in next shell. ROW 10: Ch 1, turn, sm. shell in 1st 2 shells, * (dc, ch 2, dc) in dc between shells, lg. shell in next shell, * (dc, ch 2, dc) in dc be-tween shells, sm. shell in 2 end shells. ROW 11: Ch 1, turn, sm. shell in 1st 2 shells; repeat Row 9 from * to *; sm. shell in 2 end shells. ROW 13: Ch 1, turn, sm. shell in 1st 2 shells, lg. shell in next shell; repeat from * to * in Row 10 twice; sm. shell in 2 end shells. ROW 14: Ch 1, turn, sm. shell in 1st 2 shells, (lg. shell in next shell, dc between shells) 4 times, lg. shell in next shell, sm. shell in 2 end shells. Repeat Row 14 twice. ROW 17: Ch 1, turn, sm. shell in 1st 3 shells, (dc between shells, lg. shell in lg. shell) 3 times, dc between shells, sm. shell in 3 end shells. Repeat Row 17 six times. ROW 24: Ch 1, turn, sm. shell in 1st 4 shells, dc between shells, lg. shell in next shell, dc between shells, sm. shell in 4 end shells. Repeat Row 24 twice. ROW 27: Ch 1, turn, sm. shell in 9 shells across. ROW 28: Ch 1, turn, sm. shell in 1st 3 shells, sc in next shell, sm. shell in next shell, sc in next shell, sm. shell in 3 end shells. ROW 29: Ch 1, turn, sm. shell in 1st 2 shells, sc in next shell, sm. shell in next shell, sc in next shell, sm. shell in 2 end shells. ROW 30: Ch 1, turn, 1 sm. shell, (sc in next shell, sm. shell in next shell) twice; fasten off. Ch 2, in 2d ch from hook make sc, hdc, 6 dc, hdc and sc; join to 1st sc. RND 2: Ch 1, 2 sc in same sc, 3 hdc in next st, 3 dc in next st, (4 tr in next st) twice, 3 dc in next st, 2 hdc in next st, (2 sc in next st) 3 times, join. Ch 7, sk 1 ch, sl st in next 2 ch, (draw up a lp in next 2 ch, Y 0 and draw thru 3 lps on hook) twice, sk 1 st on Head, sl st in next 2 sts; ch 4, sk 1 ch, sl st in next 2 ch, sc in next ch, sl st in next 2 sts on Head, sc in next st, hdc in next st, 2 dc in next st.
Ch 10, sk 2 ch, on bal. of chain make 2 dc, 3 tr, dc, hdc and sc; sl st in dc at base of ch-10, 2 dc in next st on Head, 2 hdc in next st, 2 sc in next st, sl st in next st.
Ch 12, sk 1 ch, sl st in next ch, on bal. of chain make sc, hdc, 6 dc, hdc and sc; sl st in next 2 sts on Head. Work following rows in back lps. Ch 1, turn, sk sl sts, sc in next 7 sts; ch 4, turn, sk 1 ch, sl st, sc and hdc on bal. of chain, dc in next 5 sts, hdc in next st, sc in next st, sl st in next st on Head; Ch 1, turn, sk sl st, sc in next 7 sts; ch 3, turn, sk 1 ch, sl st and sc on bal. of chain, hdc in next 5 sts, sc in next 2 sts, sl st in next st on Head; (ch 1, turn, sc in 7 sts) twice, sl st in next st on Head; (ch 1, turn, sc in each sc to 2d st from end, ch 2, turn, sc in each sc, sl st in next st on Head) 5 times. Fasten off. Make 2 pieces. Sew tog. around Wattles and Beaks up to Combs. Sew base of Head over top of neck from Wattle to half of 1st row of Comb. LEG: Ch 12, join with sl st to form ring. Ch 1, 14 sc in ring. Without joining and working in back lps, sc in each sc around and around, with 2 decs. in each rnd. (To dec. work 2 sc off as 1 sc) . Repeat until 8 sc are left. (Sc in each sc) repeated for 1 ¾ inch leg; sl st in next st. * Cut 10 ¼ inch wire, fold one and over ½ inch, then bend at right angles (for toe) 1 ¼ inches from folded end. Ch 10, pass long end of wire up thru leg, sl st in folded end of wire, ch 1, sc in 10 ch working over wire, ** sl st in next st to left around leg on side facing, repeat from * twice; sl st in next 2 sc, repeat from * to ** , sl st in next 2 sc, join, fasten off. Tape top end of 4 wires tog. push thru bottom of Body on left side of center row of large shells, sew top of leg to Body, sew top of wires to back of left-side Head piece. Make a 2d Leg 1 ⅞ inches long, repeat toes, push wires thru Body on other side of large shells ahead of 1st Leg, sew in place, sew wire tops to back of other Head piece. Cut 7 ¼ inch wire, fold one end over ½ inch. Chain ½ inch shorter than wire, sl st in folded end, ch 1, sc over wire into each ch st. Ch 4, turn, sk 1 ch, 3 sc on chain, sk 1st sc on wire, * sl st in next 3 sc on wire, ch 1, turn, sk 3 sl sts and 1 sc, sc in back lps of next 2 sc, ch 3, turn, sk 1 ch, sc in next 2 ch, sc in back lp of next sc; repeat from * to end; make 1 more frond, sl st in same end st, ch 1, turn, sk 1 sc, sc in next 2 sc, ch 3, turn, sk 1 ch, 2 sc on chain, sc in next 2 sc, sl st in same end st. (Ch 1, turn, sc in 1st 2 sc, ch 1, turn, sc in 1st sc, 2 sc in next sc, sl st in next 3 sts down other side of wire) repeated to end. Fasten off. Repeat for a 2d Feather, then make one with 6 ½ inch wire, 2 with 4 ¼ inch wires and 2 with 3 ½ inch wires. Sew on end of Body, pushing wire ends thru sides of Body and sewing down on inside. Sew Body tog. down back. Make a large White French Knot on each side of Head for eyes. With Black, ch 61, sk 1 ch, sc in next 60 ch. ROW 2: Ch 1, turn, sc in 60 so. Repeat Row 2 for 3 inches. Fasten off. Sew 1st and last rows tog. Sew Rooster's feet to top edge. Starch. When dry, cut 2 or 3 heavy cardboard strips and push inside Base, sew ends of Base closed. Screw a cup hook into Base 2 inches from each end. Cover 2 brass rings closely with sc. Sew on top of Base 1 inch from ends. ROW 1: Sk 1 ch, sc in 38 ch. ROW 2: Ch 1, turn, sc in 1st sc, (sc at base of next sc, sc in next sc) repeated across (ending with long sc). Repeat Row 2 until piece is square. Ch 1, turn, 3 sc in 1st sc, * sc in each st across, 3 sc in corner sc, (2 sc in next row, sc in next) repeated across, * 3 sc in corner st; repeat from * to *, join, fasten off. RND 2: Attach Black to one corner, (ch 1, sl st in next sc) repeated around, join, fasten off. Cover a brass ring closely with sc and sew to one corner. With Black ch 2, 8 sc in 2d ch from hook, join to back lp of 1st sc. RND 2: Ch 3, 2 dc in same sc, (3 dc in back lp of next sc) 7 times, join to ch-3. RND 3: Ch 1, sc in same st, working in both lps, 3 dc in next dc, sc in next dc, (ch 5, sk 3 dc, sc in next dc, 3 dc in next dc, sc in next dc) 3 times, ch 5, join to 1st sc. RND 4: Ch 1, sc in same sc, * sc in next 2 dc, ch 30, swing hook to right, sl st in starting st of ch-30, ch 1, sc in 1st 5 sts of ch-30, hdc in next 5 ch, dc in next 4 ch, 5 dc in next ch, dc in next 4 ch, hdc in next 5 ch, sc in next 4 ch, sl st in next ch, sl st in base of lp, sc in same corner dc, sc in next 2 sts, 3 sc in next ch-5 lp, ch 20, make a lp as before with sl st in starting st of ch-20, ch 1, sc in 1st 4 ch, hdc in next 3 ch, dc in next 2 ch, 5 dc in next ch, dc in next 2 ch, hdc in next 3 ch, sc in next 3 ch, sl st in end ch, sl st in base of lp, 3 sc in bal. of ch-5 lp, sc in next sc; repeat from * 3 times, join to 1st sc. Fasten off. Sew on Pot Holder. Make 2d Holder in Chartreuse. Steam and press Holders on back thru a cloth until dry. Hang on cup hooks. LILY DOUBLE QUICK, Art. 50, in Black: 2 skeins. 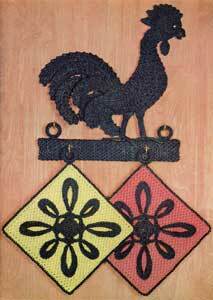 Repeat Rooster (as for Pot Holder Set). BASE: TOP: Ch 25, sk 1 ch, 4 hdc in next ch, hdc in next 22 ch, 4 hdc in end ch, hdc in 22 sts on other side of chain. Do not join. RND 2: (2 hdc in next 4 hdc, hdc in next 22 hdc) twice. RND 3: Hdc in each hdc with 5 incs. around each end. RND 4: Repeat Rnd 3 but with 6 incs. around each end. RNDS 5 thru 7: Repeat Rnd 4 three times. RND 8: Sc in each st around; sl st in next st. Fasten off. Repeat thru Rnd 7. Fasten off. Lay 2 pieces back-to-back and sew tog. thru 1 lp of each st, leaving one end open. Sew Roaster on Top Piece. Starch. When dry cut a heavy cardboard to fit Base, push inside and sew end tog.